OK, so I'm going to try this again-I started a website for the girls, with very good intention I must say, when we first moved to Midland. I did well for a while, but then...well, life happened. So as I have enjoyed reading the blogs of our friends, I became envious. I thought, how great it would be to have a place to keep up with our lives, a place where family could visit us, a place where I could ramble endlessly, and a place where you could all see my beautiful girls! So enjoy, and be blessed, because we sure are! The girls are doing great! 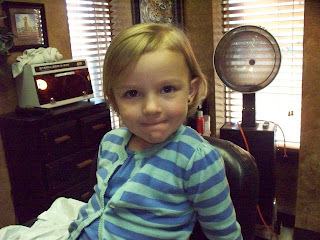 Jessilyn just got a haircut, a cute little bob, and she is absolutely precious! I don't like the fact that now she looks like she should be in kindergarten, but she already acted that way, so I guess, in that respect, it fits. (I probably used way too many commas in that sentence, but what do you do?) She is still going to preschool 3 days a week, and is doing really well. She got her first progress report last month, and did great in all areas but one-she wasn't very strong when it came to standing up for herself. This is an issue of mine I really pray I don't pass on to her, so that has become a new prayer request you can join in on with us. One of her favorite activities is to do her "homework". She doesn't actually get assigned homework, but she likes to pretend like she does. Isn't it amazing how soon we become discontent with where we are in life? If she could only realize how much she'll despise homework one day, she wouldn't be in such a hurry. On the same token, I was having a conversation with Mom just yesterday in which I was complaining about how cumbersome it is to try to really clean your house with little ones (and with a husband!). She lovingly and gently reminded me that although her house is always clean now, it is also always empty. Teach me Lord, to be content with this season of my life, to enjoy the blessings of everyday, and to learn from the frustrations. 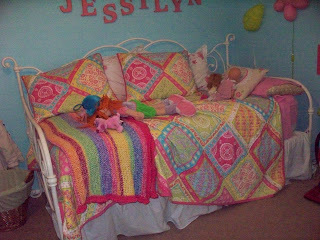 Thank you Jessilyn, for your reminder, and please don't be in such a hurry to grow up! Anyway, (getting back on topic) Jessilyn likes to cut, glue, color, and write at the kitchen table. It is very cute when she asks me to please not interrupt her until she is finished with her homework! Reese is growing so fast! She is now talking. She says Mommy, Daddy, Pops, MiMi, PaPa, ball, bo-bo (not sure how to spell? ), poo-poo, bath, dog, door, please, night night, baby, bye-bye, hi, and she attempts I LOVE YOU. She has been struggling with sickness since Halloween. We have just finished our fourth different antibiotic, and today she's running fever and feeling bad again! It is so frustrating as a parent to have a sick little one...you feel so helpless. I am frustrated myself, because I feel like by now she should really be doing much better. Please pray for healing for her ears. Reese is the child you can never turn your back on. She just has a curiousity that Jessilyn never had. 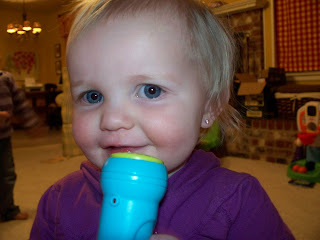 Although she keeps me very busy, she is also so much fun! Her orneriness makes me laugh. She has so much personality already, I can only imagine what she'll be like in a few years! She loves her sister very much, and already tries to imitate her. One of my favorite things is to see the two of them giving each other a hug. There is no friendship like that of sisters! I thank God for giving them that gift! Hope you enjoy the update and pictures. Love you all! Remember, I'm new at this...I can't figure out how to put captions under the pics, so here's what the pictures are: Reese singing with Jessilyn, Jessilyn's haircut, the finished product, girls eating lunch outside, and Jessilyn's first attempt at making her bed by herself (pretty good!). Maybe I'll get my stuff together! YIPEEE....YAYYYYY....WOOO HOOOO!! I love, love, love it:) I will definitley be a STALKER!! It blesses my heart to see your precious ones on a daily basis...they are so beautiful!! We will be praying for little Reese..."But for you who revere my name, the Son of Righteousness will rise with healing in His wings." (Mal. 4:2) Hold tight to this, momma:) Love you guys! 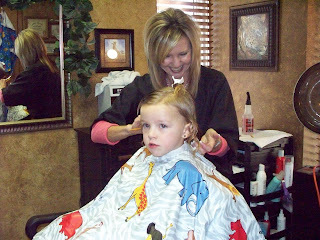 Jess' haircut is so adorable! But you are right, it does look like she should be in kindergarten. 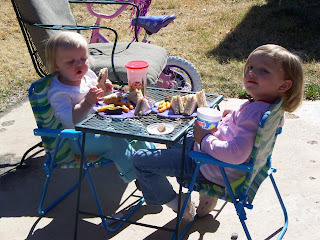 I can't believe how fast both girlies are growing up. :-( Love y'all tons. We still need to get on the tele. and talk about YOU! did you get my message on your phone the other day? Your girls are beautiful! Love you! Well I would like to be your "blog friend" but I don't know how to add you or whatever it is you have to do, so how did you get people on yours?